Can this established Swedish brand make its mark on the UK? We first heard from Swedish company Audio Pro some time around the end of the 1970s. In those pre home cinema days, a subwoofer was something new, and Audio Pro's B2.50 ACE-Bass device turned out to be a very effective unit indeed. Audio Pro is still very much in the subwoofer business, and even though its products were not distributed in the UK for many years, it certainly doesn't seem to have done the company any harm. Indeed, Audio Pro has clearly prospered, as its website currently lists ten separate ranges of speaker, while new UK importer CSE Solutions lists fifty different models from the brand, even though a number of those represent variations on similar themes. That's certainly true of this Avanti A.10 DC, where the 'DC' postscript stands for Design Collection. The DC variation on the standard Avanti A10 costs £450 per pair, whereas its non-DC equivalent is a much less painful £320 per pair. The specifications for both versions of this little two-way design are identical, apart from the surface finish. 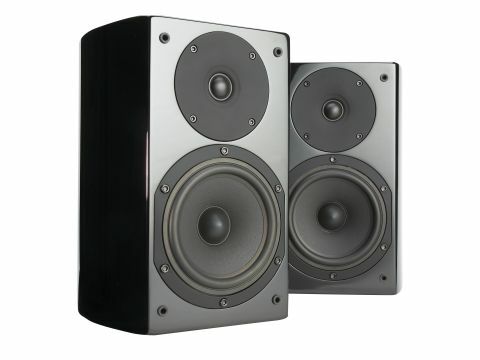 Instead of the Italian or graphite walnut used in the standard version of the loudspeaker, the DC variant has an eight-layer, high-gloss painted/lacquered finish, in white or black. It's an attractive little speaker, with dramatically curved sides that almost eliminate the back panel, giving a boat-shaped plan view. This has the triple advantage of increasing stiffness, avoiding rear-panel reflections and spreading the frequencies of internal standing waves. The narrow back is just wide enough to accommodate a tiny port, and the single terminal pair are set vertically. The main driver is a small 130mm cast frame unit, with a 95mm paper cone and twin voice-coil arrangement. The neodymium magnet tweeter is a little unusual in that it employs a 19mm fabric diaphragm (hence a lower inductance voice coil), with bandwidth claims of up to 40kHz. First impressions of the Avanti A.10 DC were very positive, as its lively character made it very easy to engage with. It might be small, with the limited bass power and weight that follows as a matter of course, but it boasts the sort of lively agility and delicacy that makes it a very good communicator of musical messages. A major contributing factor is certainly the excellent acoustic behaviour of that tough little enclosure, which ensures freedom from boxiness. Add in some rather fine time coherence between the two drivers and you are left with superior stereo imaging with fine focus, air, space and transparency. Excellent detail projection is undoubtedly an attractive feature, but is also almost certainly an exaggeration and a departure from neutrality arising from the upper-mid peak seen in the measurements. The overall tonal balance is a trifle bright - not because there's too much treble, but because the bottom end could do with a bit more weight, warmth and punch low down. Is that fancy high gloss lacquer finish really worth an extra £130 though? At £450 this DC version of the A.10 is a trifle costly in view of its measured response limitations. Overall, though, it remains an exceedingly entertaining and communicative little speaker, which, at £320 without the fancy finish, would rate a 'Best Buy'.